Bright Colored Beluch Medallion with Four Heavy Trucks. This war rug is in new condition. It has a very bright color palate. It has an even blue field which is brighter than most Beluchi blue fields. He secondary and tertiary colors are brighter than usual as well. Some of these brighter colors are: pink, chartreuse, turquoise, and electric blue. These vibrant colors give this rug a lot of vitality. The peach colored guard stripes (small borders inside and outside main border.) provide a strong contrast for the blue field. Very artistically done. There is a nice variety of small motifs like birds and animals throughout the field. The war images consist of 4 vehicles, which look like either heavy military trucks or the highly decorated trucks you one sees in Afghanistan. 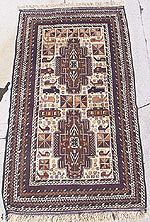 This extraordinary war rug is in very good condition with some minor bleeding throughout into the light field color, as seen in the photographs.